The time period of 1550 – 1800 was a time when the world saw the emergence of the “Absolute Monarchy”, which is a king or queen who has complete control over a country. Absolutism originated in Spain when Philip II was in power, and it began to fade out after the rule of Catherine the Great in Russia. 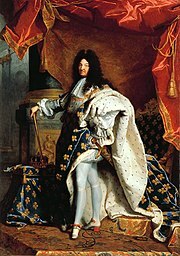 Because this 250-year period saw the rise and fall of many absolute monarchs, it is known as the “Age of Absolutism”. Absolute Monarch Ideology: The ideology that absolute monarchs follow is called “absolutism”. All of the mentioned absolute monarchs were successful because they all followed the ideology, or belief, of absolutism to perfection. Absolutism has three key components. The first is having a strong central government so that no one can stand in the way of the monarch’s policy making. The second is having a strong military to deal with war when the country expands its boundaries or if an invasion from another country may occur. The third and final is using the economic theory mercantilism, (the policy of exporting more than is imported) to create a strong economy and wealth for the country in order to support the countries absolutist tendencies. Answer these questions on a separate sheet of paper. 1. In what time period did the Age of Absolutism occur? 2. Explain what an absolute monarch / monarchy is. 3. What is the name of the ideology that absolute monarchs follow? 4. What are the three key components of absolutism? Explain each one in detail. What positive and negative effects did absolute rule have in Europe and around the world?